Exhibition from Cotober 26th to November 22nd 2007. This work will be shown at ESAV in Marrakech (École des arts visuels) in the framework of the AiM festival, from November 24th to December 12th. L’appartement 22 is pleased to announce the first ever exhibition of artist Hamdi Attia in Morocco. In “World Map,” Hamdi Attia proposes an alternative world, one which de-emphasizes the Northern hemisphere and instead orients itself around the equator. It is a world whose countries and oceans have familiar sounding but highly elusive names; a world which is recognizable and yet wholly unknown. “World Map,” however, is not a world as imagined by Attia alone. Instead, the shapes, names, and subsequent narratives of the countries, cities, oceans, and seas are pulled from the imaginations of Attia’s colleagues and students. It is this collective, collaborative process of (re)picturing the world that enables Attia to successfully make his socio-political critique of cartography. 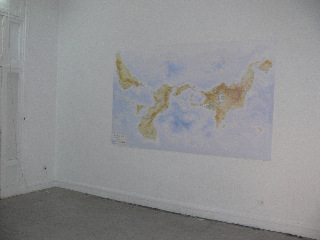 “World Map” will be on display at L’appartement 22 until 30 November 2007. Visits are by appointment only.